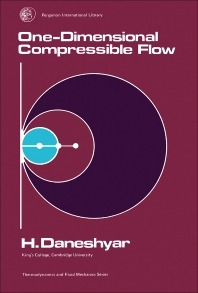 One-Dimensional Compressible Flow explores the physical behavior of one-dimensional compressible flow. Various types of flow in one dimension are considered, including isentropic flow, flow through a convergent or a convergent-divergent duct with varying back pressure, flow with friction or heat transfer, and unsteady flow. This text consists of five chapters and begins with an overview of the main concepts from thermodynamics and fluid mechanics, with particular emphasis on the basic conservation equations for mass, momentum, and energy that are derived for time-dependent flow through a control volume. The chapters that follow provide a basis for understanding steady flow with area change, friction, or heat transfer. A method for solving unsteady flow problems is described in the final chapter, which also discusses the propagation of small disturbances and unsteady flow with finite changes in fluid properties. This book will be useful to senior students pursuing a degree course in mechanical engineering and to engineers in industry.